The most coveted fashion week in India just got over and we are absolutely stunned. Kareena Kapoor Khan, we’re in awe! The beautiful Kareena looked like a million bucks when she walked the ramp for the Lakme Fashion Week that took place at The St. Regis hotel, Mumbai. She closed the ceremony with a bang! Literally. She wore a gorgeous olive green bridal lehenga outfit designed by Sabyasachi Mukherjee with a statement maang tika. 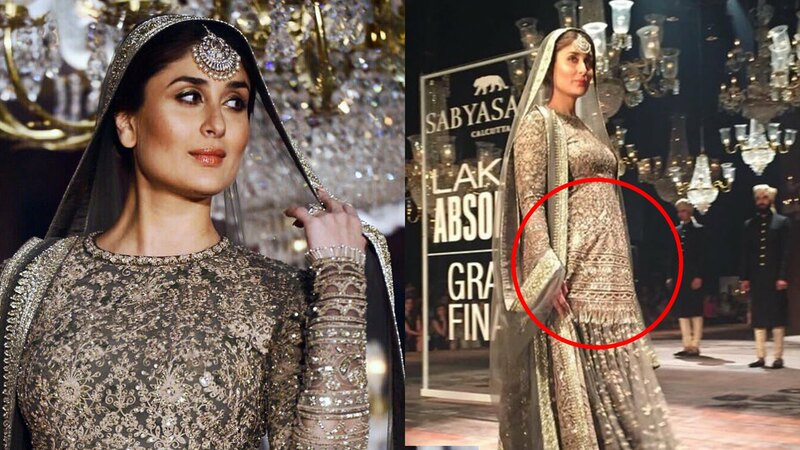 Kareena is very emotional and nervous about what she called to be “special” as this was her first ever ramp walk for the talented designer and that too with the highlight being that baby bump. She said, “We were walking the ramp together” (she and her baby). She further added, "Pregnant woman can walk and fly and for me it's absolutely normal." Even Deepika Padukone amongst others, who was seated in the first row along with Bebo’s sister Karishma Kapoor was left absolutely awestruck and could not stop cheering! Man, don’t we just love her and her confidence! All the best to Bebo and Saif!